Driving a minivan has never looked as good as it does when you’re behind the wheel of the 2017 Toyota Sienna. This minivan crushes its segment’s stereotypes with innovative standard features like Split & Stow 3rd Row™ seating and an all-new powerful powertrain. The Toyota Sienna also has a wraparound dashboard that is driver-oriented and easy-to-use, which makes it the perfect cockpit for any soccer mom. The 2017 Toyota Sienna is offered in five trim levels: L, LE, SE, XLE, and Limited. Star Safety System™ — includes Enhanced Vehicle Stability Control (VSC), Traction Control (TRAC), Anti-lock Brake System (ABS), Electronic Brake-force Distribution (EBD), Brake Assist (BA) and Smart Stop Technology® (SST). If you want to ride around town in style, but still have plenty of room for the kids, look no further than the 2017 Toyota Sienna. It has plenty of available safety features, like Blind Spot Monitoring and Rear Cross-Traffic Alert. The available dual moonroof also adds a clear view and plenty of natural light in the cabin, adding another interesting aspect to the Toyota Sienna’s style. 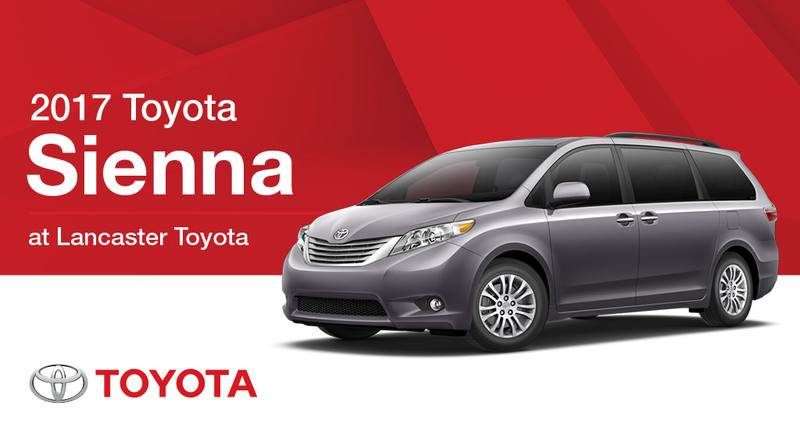 Come in to Lancaster Toyota today to learn more about this great minivan.